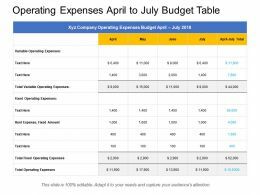 Presenting operating expenses april to july budget table. 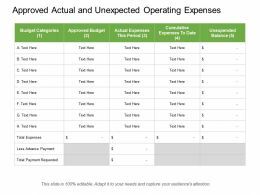 This is a operating expenses april to july budget table. This is a four stage process. The stages in this process are operating expenses, operating costs, business expenditures. 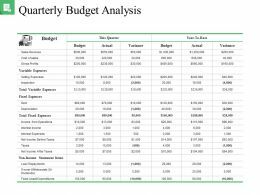 Presenting this set of slides with name - Quarterly Budget Analysis Good Ppt Example. This is a two stage process. 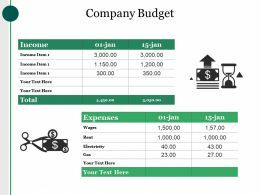 The stages in this process are Budget, Variable Expenses, Total Variable Expenses, Fixed Expenses, Non Income Statement Items. 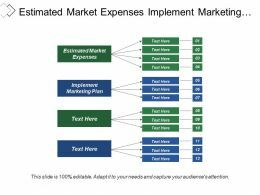 Presenting new business marketing strategy financing expense model powerpoint presentation slides. 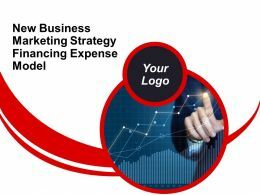 This is a new business marketing strategy financing expense model powerpoint presentation slides. The stages in this process are business growth, revenue improvement, business improvement. 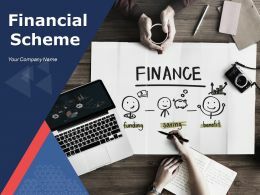 Presenting this set of slides with name - Financial Scheme Powerpoint Presentation Slides. This is a one stage process. 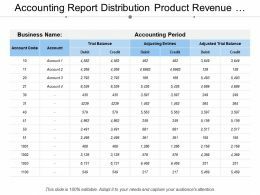 The stages in this process are Sales Budget, Sales Cost, Sales Financial Plan. Presenting budget icon flat. This is a budget icon flat. This is a six stage process. 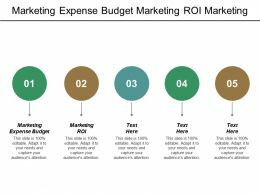 The stages in this process are budget icon, fund icon, expense icon. 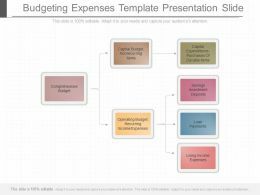 Presenting this set of slides with name - Company Budget Expenses Ppt Layouts Background Designs. This is a two stage process. The stages in this process are Business, Planning, Strategy, Marketing, Management. 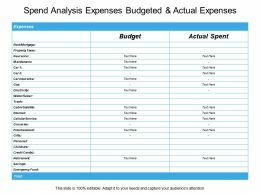 Presenting this set of slides with name - Spend Analysis Expenses Budgeted And Actual Expenses. This is a two stage process. The stages in this process are Spend Analysis, Spend Management, Procurement. 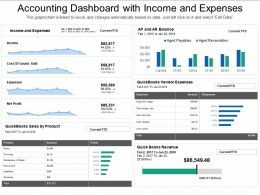 "Microsoft PowerPoint Template and Background with budget cuts layoffs and dropped sales business model"
Presenting quarter ended operating expenses budget. This is a quarter ended operating expenses budget. This is a four stage process. The stages in this process are operating expenses, operating costs, business expenditures. 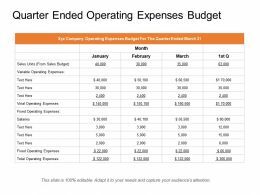 Presenting operating expenses monthly budget table. 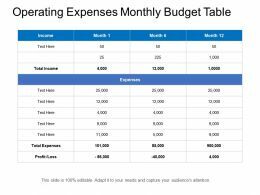 This is a operating expenses monthly budget table. This is a three stage process. The stages in this process are operating expenses, operating costs, business expenditures. 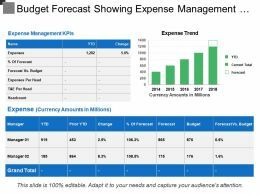 Presenting this set of slides with name - Budget Forecast Showing Expense Management And Expenses. This is a three stage process. The stages in this process are Budget Forecast, Forecast Vs Actual Budget, Plan Vs Forecast. 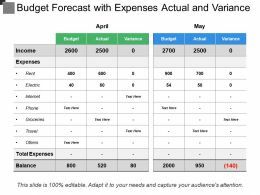 Presenting this set of slides with name - Budget Forecast With Expenses Actual And Variance. This is a two stage process. The stages in this process are Budget Forecast, Forecast Vs Actual Budget, Plan Vs Forecast. 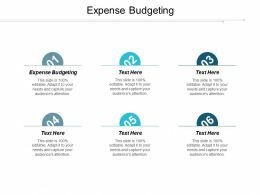 Presenting this set of slides with name - Event Summary Checklist Of Expense Budget 1. This is a three stage process. The stages in this process are Event Summary, Event Overview, Event Description. 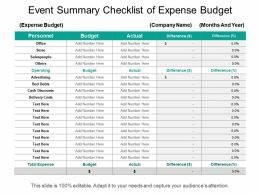 Presenting this set of slides with name - Event Summary Checklist Of Expense Budget 2. This is a five stage process. 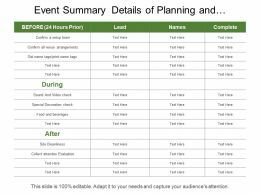 The stages in this process are Event Summary, Event Overview, Event Description. Presenting operating expenses approved and proposed budget table. 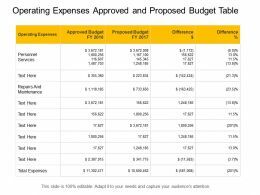 This is a operating expenses approved and proposed budget table. This is a four stage process. The stages in this process are operating expenses, operating costs, business expenditures. 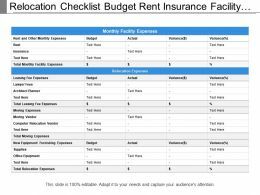 Presenting this set of slides with name - Relocation Checklist Budget Rent Insurance Facility Expenses Equipment. This is a four stage process. The stages in this process are Relocation, Offshoring, Outsourcing. Presenting operating expenses layout. 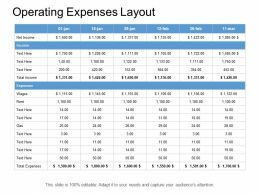 This is a operating expenses layout. This is a six stage process. The stages in this process are operating expenses, operating costs, business expenditures. 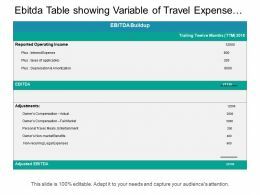 Presenting this set of slides with name - Expense Management Showing Travel And Expenses. This is a four stage process. The stages in this process are Expense Management, Cost Management, Price Management. 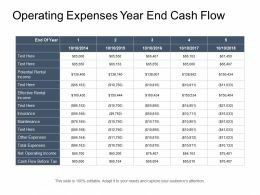 Presenting operating expenses year end cash flow. This is a operating expenses year end cash flow. This is a five stage process. The stages in this process are operating expenses, operating costs, business expenditures. 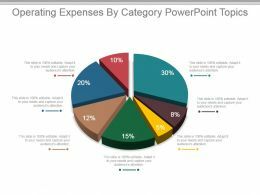 Presenting operating expenses by category powerpoint shapes. 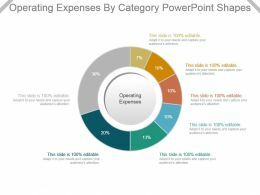 This is a operating expenses by category powerpoint shapes. This is a seven stage process. The stages in this process are operating expenses. Presenting calculations of medical expenses good ppt example. 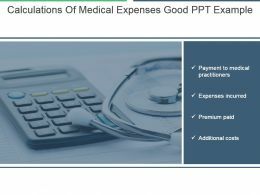 This is a calculations of medical expenses good ppt example. This is a two stage process. The stages in this process are payment to medical practitioners, premium paid, additional costs. 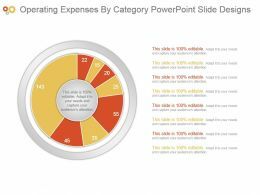 Presenting operating expenses by category powerpoint slide designs. This is a operating expenses by category powerpoint slide designs. This is a eight stage process. The stages in this process are business, management, marketing, finance, operating. Presenting operating expenses by category powerpoint slide inspiration. This is a operating expenses by category powerpoint slide inspiration. This is a five stage process. The stages in this process are business, management, marketing, finance, operating. Presenting operating expenses by category powerpoint topics. 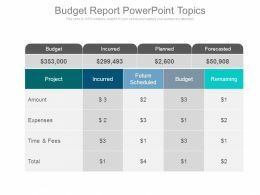 This is a operating expenses by category powerpoint topics. This is a seven stage process. The stages in this process are business, management, marketing, finance, pie. Presenting operating expenses by category ppt background images. 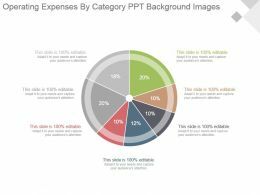 This is a operating expenses by category ppt background images. This is a seven stage process. The stages in this process are business, management, marketing, finance, operating. 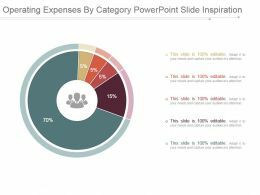 Presenting operating expenses by category ppt icon. This is a operating expenses by category ppt icon. This is a seven stage process. The stages in this process are business, management, marketing, finance, operating. 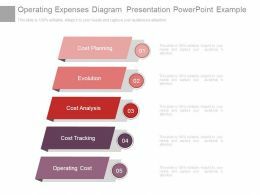 Presenting operating expenses diagram presentation powerpoint example. 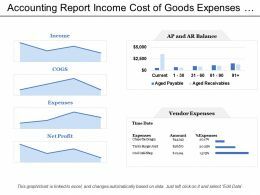 This is a operating expenses diagram presentation powerpoint example. This is a five stage process. 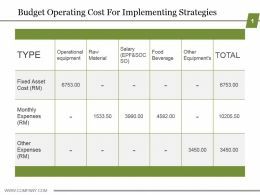 The stages in this process are cost planning, evaluation, cost analysis, cost tracking, operating cost. 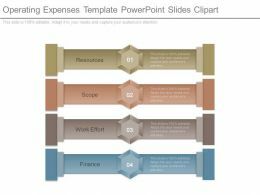 Presenting operating expenses template powerpoint slides clipart. 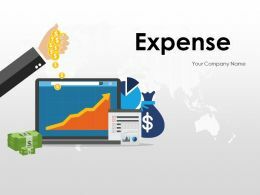 This is a operating expenses template powerpoint slides clipart. This is a four stage process. The stages in this process are resources, scope, work effort, finance. 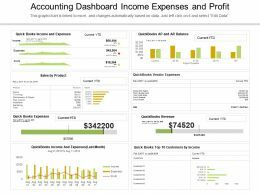 Presenting this set of slides with name - Accounting Dashboard Income Expenses And Profit. This is a six stage process. 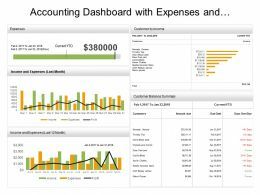 The stages in this process are Accounting, Bookkeeping, Auditing, Finance. 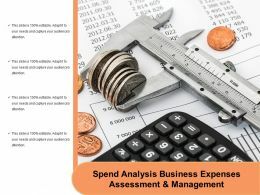 Presenting this set of slides with name - Spend Analysis Business Expenses Assessment And Management. This is a four stage process. The stages in this process are Spend Analysis, Spend Management, Procurement. Presenting approved actual and unexpected operating expenses. This is a approved actual and unexpected operating expenses. This is a four stage process. The stages in this process are operating expenses, operating costs, business expenditures. "Microsoft PowerPoint Template and Background with Office desk aranged in studio. A lot of numbers and graphs". 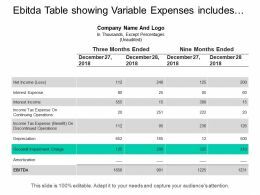 Presenting this set of slides with name - Ebitda Table Showing Variable Expenses Includes Income Tax Expenses Interest Income. This is a five stage process. The stages in this process are Ebitda, Accounting Measure, Private Equity. 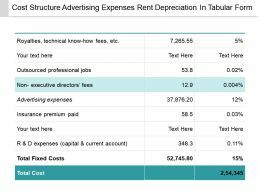 Presenting cost structure advertising expenses rent depreciation in tabular form. 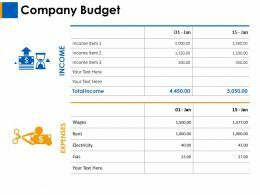 This is a cost structure advertising expenses rent depreciation in tabular form. This is a two stage process. The stages in this process are cost structure, budget framework, fun model. 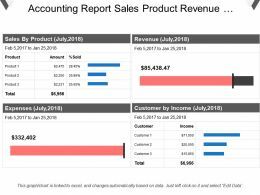 Presenting track profits and expenses example powerpoint slide presentation examples. This is a track profits and expenses example powerpoint slide presentation examples. This is a seven stage process. The stages in this process are return, investment, money, costs, margins, profits, price. 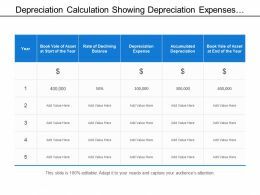 Presenting this set of slides with name - Depreciation Calculation Showing Depreciation Expenses And Accumulated Depreciation. This is a five stage process. The stages in this process are Depreciation, Devaluation, Decline. 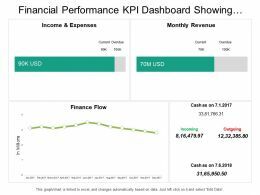 Presenting this set of slides with name - Financial Performance Kpi Dashboard Showing Income Expenses Monthly Revenue. This is a four stage process. The stages in this process are Financial Performance, Financial Report, Financial Review. 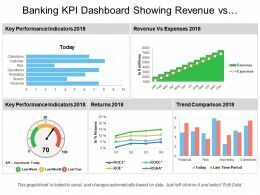 Presenting this set of slides with name - Banking Kpi Dashboard Showing Revenue Vs Expenses And Returns. This is a five stage process. The stages in this process are Banking, Finance, Money. 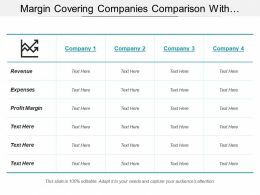 Presenting this set of slides with name - Margin Covering Companies Comparison With Revenue Expenses And Profit. This is a four stage process. The stages in this process are Edges, Margin, Limits. 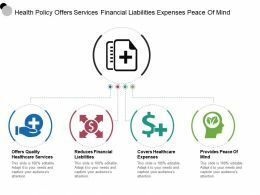 Presenting this set of slides with name - Health Policy Offers Services Financial Liabilities Expenses Peace Of Mind. This is a four stage process. The stages in this process are Health Policy, Health Plans, Health Strategy. Presenting this set of slides with name - Key Hr Metrics Showing Hr Staff Expenses Compensation And Training. This is a three stage process. The stages in this process are Hr Metrics, Hr Initiatives, Human Resource Metrics. 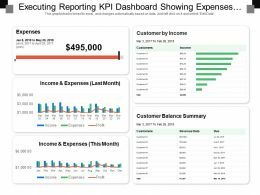 Presenting this set of slides with name - Executing Reporting Kpi Dashboard Showing Expenses Customer By Income. This is a five stage process. The stages in this process are Executive Reporting, Executive Analysis, Executive Performance. 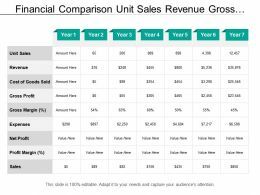 Presenting this set of slides with name - Financial Comparison Unit Sales Revenue Gross Profit Expenses. This is a seven stage process. The stages in this process are Financial Comparison, Financial Analysis, Financial Statement. 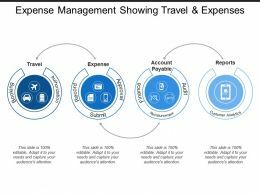 "Microsoft PowerPoint Template and Background with Dollar bill being cut in half by a pair of scissors"
Presenting this set of slides with name - Ebitda Table Showing Variable Of Travel Expense With Non Recurring Legal Expenses. This is a three stage process. The stages in this process are Ebitda, Accounting Measure, Private Equity. 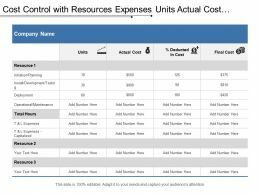 Presenting this set of slides with name - Cost Control With Resources Expenses Units Actual Cost And Percentage Deducted. This is a four stage process. The stages in this process are Cost Control, Price Control, Money Control. 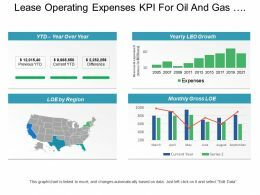 Presenting this set of slides with name - Lease Operating Expenses Kpi For Oil And Gas Industry Kpi Dashboard. This is a four stage process. The stages in this process are Mining, Oil And Gas Extraction, Refinery, Natural Gas. 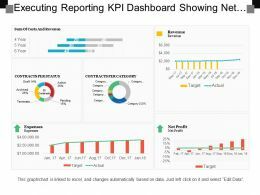 Presenting this set of slides with name - Executing Reporting Kpi Dashboard Showing Net Profit Expenses Contracts Per Category. This is a six stage process. The stages in this process are Executive Reporting, Executive Analysis, Executive Performance. 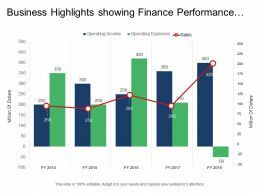 Presenting this set of slides with name - Business Highlights Showing Finance Performance With Segment Of Operating Income And Expenses. This is a five stage process. The stages in this process are Business Highlights, Company Highlights, Business Key Points. 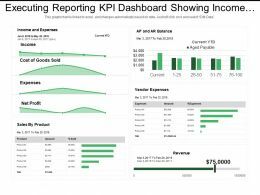 Presenting this set of slides with name - Executing Reporting Kpi Dashboard Showing Income Sales By Product Vendor Expenses. This is a four stage process. The stages in this process are Executive Reporting, Executive Analysis, Executive Performance. Presenting budget icon briefcase. This is a budget icon briefcase. This is a six stage process. The stages in this process are budget icon, fund icon, expense icon. Presenting recruitment budget presentation ideas. This is a recruitment budget presentation ideas. This is a three stage process. 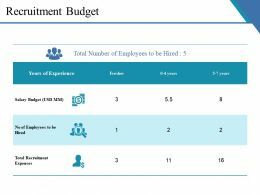 The stages in this process are salary budget, no of employees to be hired, total recruitment expenses. Presenting recruitment budget powerpoint slide show. This is a recruitment budget powerpoint slide show. This is a three stage process. The stages in this process are years of experience, salary budget, total recruitment expenses, no of employees to be hired. Presenting recruitment budget ppt background designs. This is a recruitment budget ppt background designs. This is a three stage process. The stages in this process are years of experience, fresher, salary budget, total recruitment expenses. Presenting budget icon in balance scale. This is a budget icon in balance scale. This is a six stage process. The stages in this process are budget icon, fund icon, expense icon. 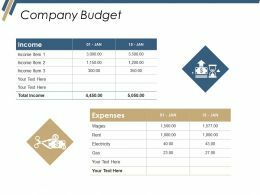 Presenting budget icon in notice form. This is a budget icon in notice form. This is a six stage process. The stages in this process are budget icon, fund icon, expense icon. 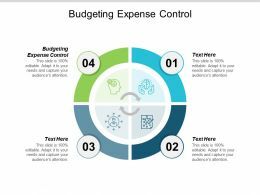 Presenting budget icon screen and circles. This is a budget icon screen and circles. This is a six stage process. The stages in this process are budget icon, fund icon, expense icon. Presenting this set of slides with name - Recruitment Budget Ppt Gallery Aids. This is a three stage process. The stages in this process are Salary Budget, Fresher, Total Recruitment Expenses, Years. 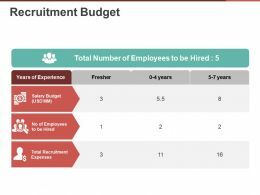 Presenting this set of slides with name - Recruitment Budget Ppt Gallery Topics. This is a three stage process. 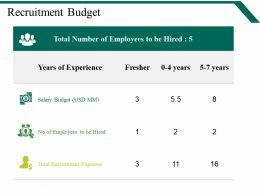 The stages in this process are Salary Budget, Fresher, Total Recruitment Expenses, Years. 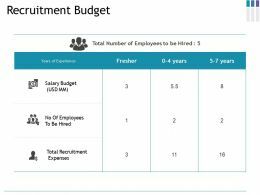 Presenting this set of slides with name - Recruitment Budget Ppt Infographic Template. This is a three stage process. 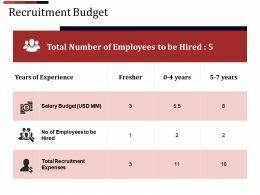 The stages in this process are Salary Budget, No Of Employees To Be Hired, Total Recruitment Expenses, Fresher, Years Of Experience. 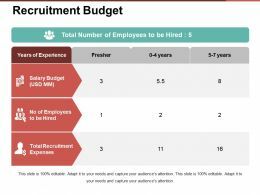 Presenting this set of slides with name - Recruitment Budget Ppt Examples Slides. This is a three stage process. 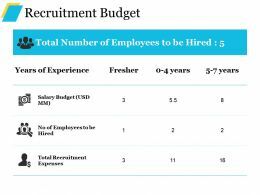 The stages in this process are Salary Budget, No Of Employees To Be Hired, Total Recruitment Expenses. Presenting 5 point budget icon in hexagonal shape. This is a 5 point budget icon in hexagonal shape. This is a five stage process. The stages in this process are budget icon, fund icon, expense icon. Presenting this set of slides with name - Company Budget Ppt Diagrams. This is a two stage process. 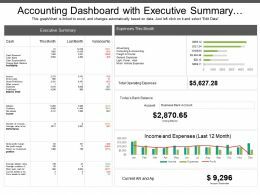 The stages in this process are Income, Expenses, Compare, Table, Business. 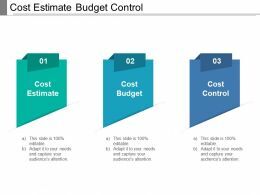 Presenting this set of slides with name - Cost Estimate Budget Control. This is a three stage process. 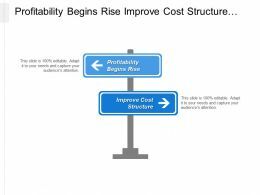 The stages in this process are Cost Estimate, Price Estimate, Value Estimate. 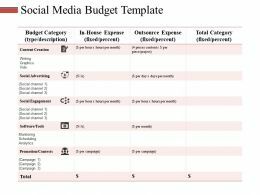 Presenting this set of slides with name - Social Media Budget Template Ppt Slides Portrait. This is a five stage process. The stages in this process are Budget Category, In House Expense, Outsource Expense, Total Category, Business. 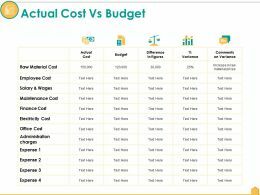 Presenting this set of slides with name - Actual Cost Vs Budget Ppt Portfolio Demonstration. This is a five stage process. 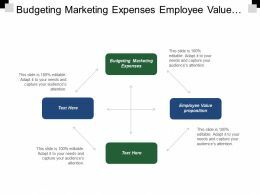 The stages in this process are Budget, Actual Cost, Variance Cost, Employee Cost, Expense. Presenting recruitment budget powerpoint slide themes. This is a recruitment budget powerpoint slide themes. This is a three stage process. The stages in this process are fresher, years of experience, total recruitment expenses, no of employees to be hired. Presenting recruitment budget example of ppt presentation. 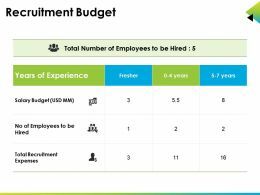 This is a recruitment budget example of ppt presentation. This is a three stage process. 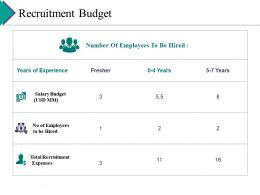 The stages in this process are years of experience, fresher, salary budget, no of employees to be hired, total recruitment expenses. 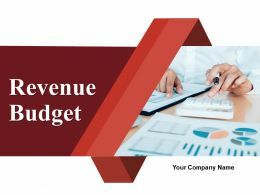 Presenting this set of slides with name - Company Budget Powerpoint Slide Deck. This is a two stage process. The stages in this process are Income, Income Item, Expenses, Wages, Rent. 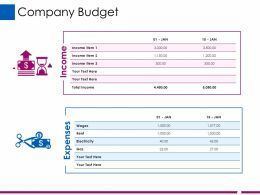 Presenting this set of slides with name - Company Budget Ppt Design Templates. This is a two stage process. The stages in this process are Income, Expenses, Compare, Business, Management. Presenting production budget powerpoint presentation slides. 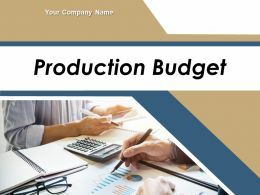 This is a production budget powerpoint presentation slides.The stages in this process are production budget, production cost, production financial plan. 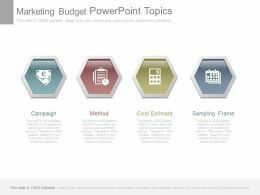 Presenting sales budget powerpoint presentation slides. 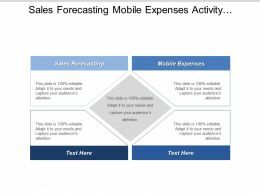 This is a sales budget powerpoint presentation slides. 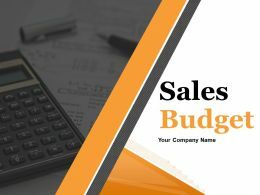 The stages in this process are sales budget, sales cost, sales financial plan. 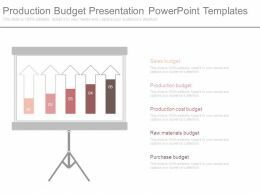 Presenting production budget presentation powerpoint templates. This is a production budget presentation powerpoint templates. This is a five stage process. The stages in this process are sales budget, production budget, production cost budget, raw materials budget, purchase budget. 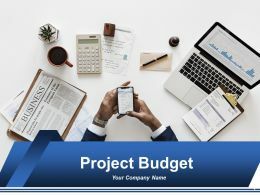 Presenting this set of slides with name - Project Budget Powerpoint Presentation Slides. The stages in this process are Project Budgeting, Project Financing, Project Costing. 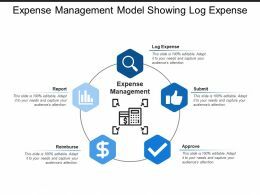 Presenting this set of slides with name - Expense Management Model Showing Log Expense. This is a five stage process. The stages in this process are Expense Management, Cost Management, Price Management.